The famous guidebook writer and publisher, Karl Baedeker, never visited Ireland. But many of his contemporaries did. Using a selection of these old books, Vitaliev retraces their steps and reports on twenty-first century Ireland, in the age of the Celtic Tiger, contrasted with the island a century ago. Vitali Vitaliev is a vastly experienced travel writer and a man who understands exile and displacement. His portrait of Ireland is affectionate and slightly perplexed. He does not hesitate to note the litter, the lousy food in many places, the shabbiness and lack of grooming, the ridiculous expense of simple things. He also finds much kindness, stunningly beautiful scenery, evidence of new hope and prosperity everywhere. 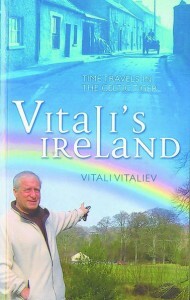 In short, Vitali’s Ireland is a job lot of a country, a place very obviously in transition. It knows it is being carried along on a tide of change but is unsure of the destination. Behind some of the new swagger, he detects great uncertainties.